The takeover of Melbourne House was big news (at least, it felt like to us.) 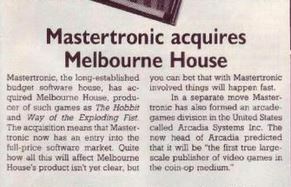 Here is how Amstrad Action reported it, in April 1987. They also noted the start of the Arcadia project.